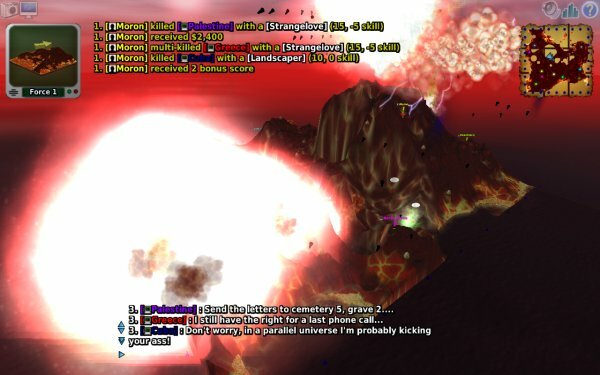 It has been some five, almost six years since I reviewed Scorched3D, the successor to the legendary, timeless mother-of-all-games, Scorched Earth. With your permission, I would like to redo this article, with some fresh information. What has changed in half the decade, except me becoming smarter? 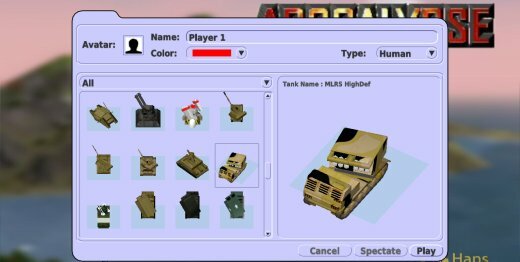 For those of you less familiar with the title, Scorched3D is a turn-based artillery game. You and a handful of other players, humans or bots, are landed onto a geographically challenged map, where you fight to the last breath, using every means available. Each player must ready his/her deadly arsenal, including elevation, bearing and power, taking into account the weather conditions, the terrain layout, as well as the strengths and positions of his foes. Some maps allow unlimited time to get ready for combat. Others restrict you, so you must be quick with your fingers. Then, when the clock ticks the S-Second, weapons are set free. Visually, the game retains its sweet, retro looks. You get the simplicity of DOS, infused into the age of proper 3D rendering. Maps are curvy and rich with valleys and hills, which serve as natural defenses as well as barriers in your combat against other players. Some levels have death traps and mines scattered all over. Others are rich with gifts, which parachute ever so often. Others yet come with a furious, boiling red sky that will fire lightning, and guess what kind of objects attract all that fury? Yup, metallic bodies of tanks and other curiously shaped things that you call your fellow players and foes. 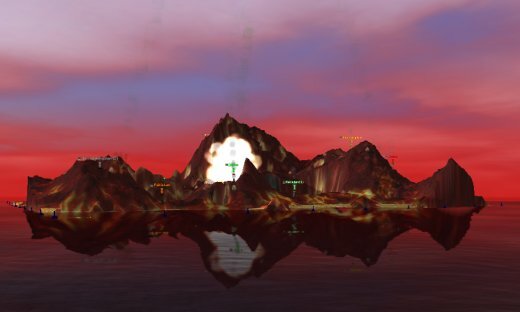 Then, you get all kinds of effects, like the soft rippling of the sea, with reflections and glare and whatnot, birds crying, volcanoes rumbling, other weird chirping noises, which serve to distract you but also get you in the right mood for killing. 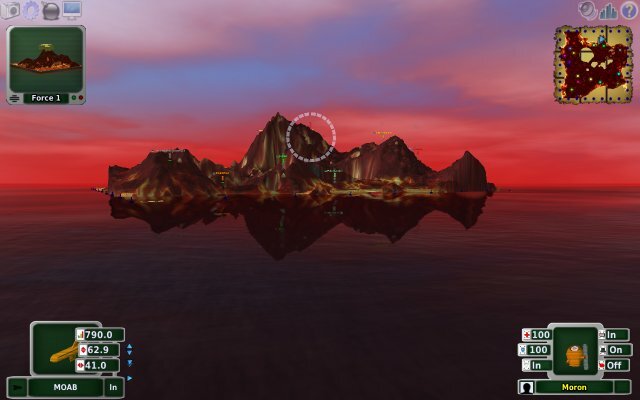 Scorched3D allows both Internet and LAN multiplayer, with up to 24 players at the same time, so it can get crowded. There are dozens of avatars available to choose from, so your units can have distinct looks. This can also help you spot your would-be friends or secret allies. 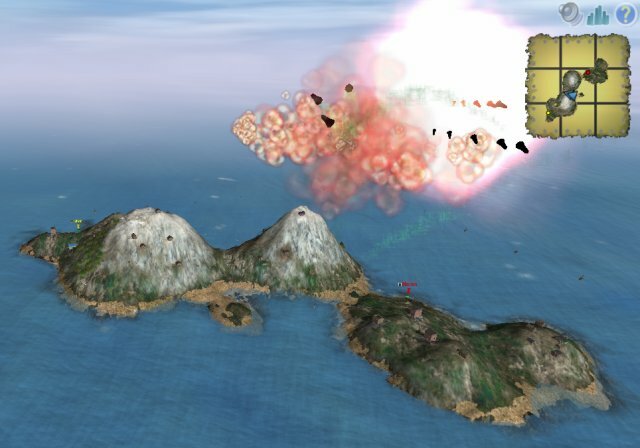 Finally, a free-rotating camera will let you zoom in and out from every possible angle, allowing you to make those fine adjustment to your missiles and cannon. All in all, the fighting comes down to aiming well, shooting a few innocent tracers or el-cheapo missiles until they start scoring, after which you let loose your best weapons. For mass kills, nothing works better than tactical nukes and other crazy weapons. Two game modes are available, the normal mode which reuses all of the weapons that were originally available in Scorched Earth. And then you also have the Apocalypse Mode, which lets you use some really nasty and crazy tools, like the Doomsday Device, Dr. Strangelove, Meteor Strike, and others. Of course, they all cost money. 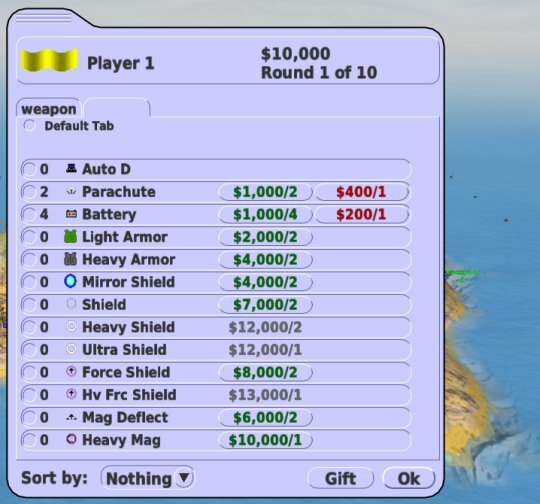 At the beginning of each round, you are allowed some time to purchase weapons, defenses, extra battery kits for mobility, and other items that should help you survive the round. You have limited budget, so you must choose carefully. Will you invest more in your shields or advanced weapons? Or both? Remember, each hit will damage you to some degree, quite often affecting your power, which will limit your maximal engagement range. Therefore, it seems that having good shields is imperative, because if you get damaged early on, even your best weapons won't save you if you can't hurl them far enough. On the other hand, if you can wipe our half the map in the first go, then why not. 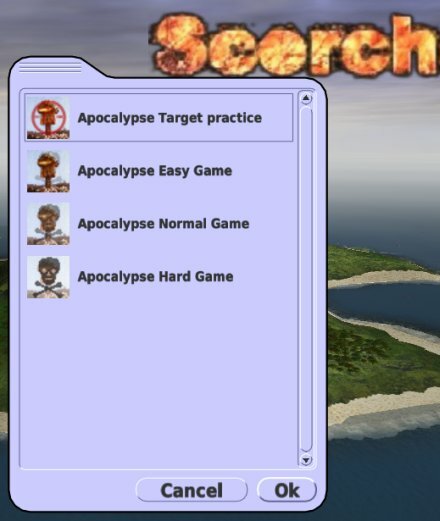 Tactics play an important part in how you manage your game, which makes Scorched3D so unpredictable, so fun, especially when you play against humans, as they tend to make mistakes. Your goal is to earn as much money as you can for the next round, thus allowing yourself more freedom in choosing even better weapons and defenses. It's exponential fun, in a way. You will get money for smart kills, crazy kills, and staying alive as long as possible. If you manage a lucky streak, you will soon be ahead of your enemies with the best available weapons. However, if you get yourself annihilated too many times, you will struggle against your foes in later rounds. You must also be careful when you use some of the special weapons, as they are so destructive, they will sink an entire island. Moreover, elevation plays an important part. The higher you fire some of these special weapons, the higher the spread. So if you want to survive the backlash, you'd better lob low and far and pray. On other occasions, you will want the super-deadly weapons for guaranteed kills. Just make sure you aim well, as they will crater the level rather nicely. When it comes to securing the death of your enemies with as little collateral damage as possible, then you may want to choose one of the more powerful, single-blast, impact weapons. For example, here's Tsar Bomba in action, plinking an enemy tank. Like I mentioned earlier, the graphics are quite lovely. Simple yet powerful. You get fancy sky, lighting effects, water reflection. It's quite charming. Even if you crank every detail up to the max, you will still be able to play this game rather comfortably even on old machines. I tested this game on T60p with an aging ATI card, and it ran without any difficulties. Scorched3D is the perfect all-family game. It has everything for everyone. In the worst case, you can use the game to teach your kids about wind resistance and ballistics. Or just have some innocent fun blasting the world to bits after a long day. Free, cross-platform, light on the machine resources, colorful, beautiful, and funny. 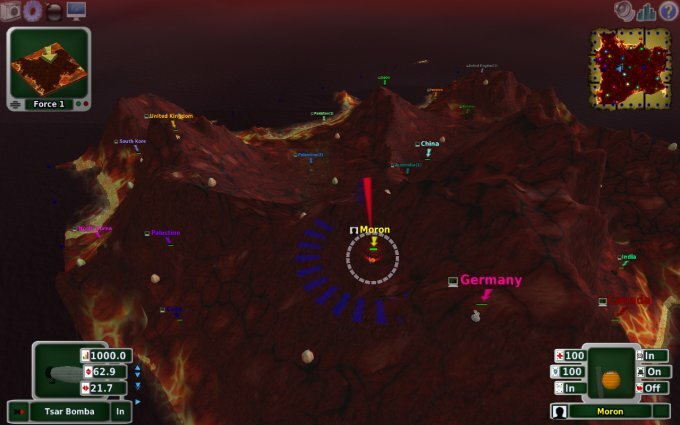 Even if you have no friends, you can still spend many a merry moment honing your spatial skills playing against the computer, which can put us some rather feisty resistance, even at moderately easy levels. 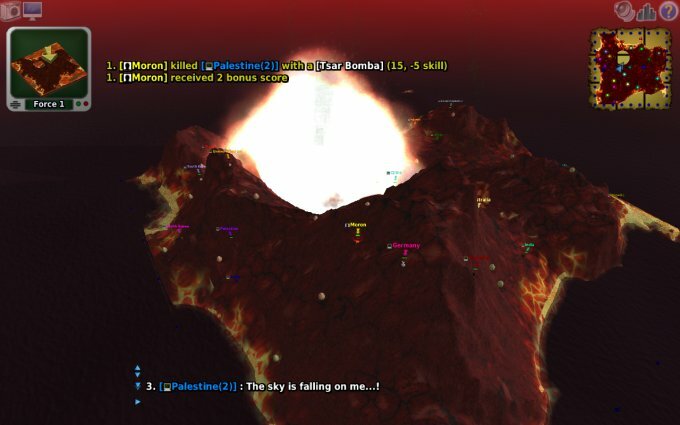 Do not crank the difficulty to high, as you will be JDAM-ed within seconds. Hoard that gold and then watch your finest weapons blast the map to tiny bits. I voted the game the best of 2010, and it's still true today. Have fun, dear readers!